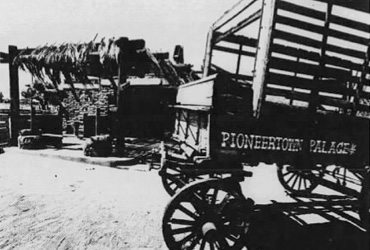 PIONEERTOWN – Nestled in the hills four miles west of Yucca Valley lies Pioneertown, an escape from the modern world. With its dirt roads, Old West-style buildings complete with horse hitching posts and quiet serenity, Pioneertown has a real western charm. Built by a group of movie actors in 1946, the town was originally designed to serve as a movie set. 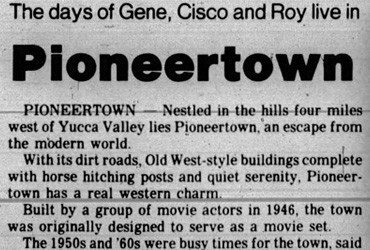 The 1950s and 60’s were busy times for the town, said Pioneertown resident Wayne Garrison. “They were busy shooting movies all the time with people like Gene Autry, the Cisco Kid, and Roy Rogers. They filmed a lot of western Television shows here too,” he said. A resident since 1978, Garrison said he started spending weekends here in 1948. “I came up here to get away from everything,” he said. 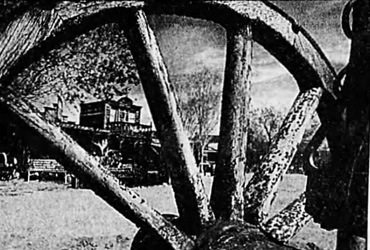 Garrison said the movie boom ended when the actors who built the town ended their joint operation. Then came speculators who bought the town with big plans and then sold it after the plans fell through, he said. “One person even had plans to turn this into one of those nudist places'” Garrison said. But regular folks also discovered the charm of Pioneertown. They bought some old buildings on Mane Street, turned them into homes, or bought nearby land and built homes. And unlike the speculators, they stayed. “This is a wonderful place. When you buy a home here, you’re buying privacy. You’re buying a more safe, natural environment,” said Constance Walsh, president of the Pioneertown Property Owners Association. She said there are 250 people living in the one-square-mile of Pioneertown. And while the movie business isn’t booming anymore, film commercials are often shot here. “They still like this place. Where else do you get to shoot a movie town for free?” Walsh said. She said if residents are home, they’ll negotiate with the production crew for payment if their house is used in the filming. Within the town are a restaurant and bar with live country and western music, a motel, animal park, (UNREADABLE) bowling alley.